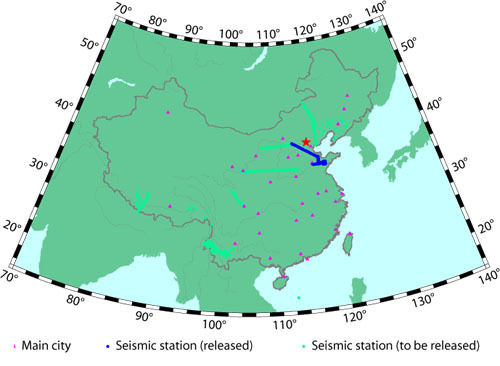 WDC for Geophysics, Beijing is supported by Institute of Geology and Geophysics, Chinese Academy of Sciences (IGGCAS). The IGGCAS was formed through the integration of the Institute of Geology, CAS and the Institute of Geophysics, CAS in June 1999. The IGGCAS is one of the most important and well-known geosciences research institutions in China. The institute's strategic perspective is for "building an international research center equipped with strong basic research and resources for technological innovation on the frontiers of solid earth and space sciences". There are two main observation systems, Space Environment Exploration System and Seismic Array Observation System, which are the main data sources of WDC for Geophysics, Beijing. Solar-Terrestrial Environment Research Network (STERN) is consisted of nine observation stations of Chinese Academy of Sciences (CAS). The nine observation stations belong to Institute of Geology and Geophysics, CAS, Institute of Atmospheric Physics, CAS, Institute of High Energy Physics, CAS, National Space Science Center, CAS, University of Science and Technology of China. The stations distribute from our northernmost Mohe, after Beijing, Wuhan, to the southern tip of Hainan Island. They have multi-tools to do comprehensive observation involved ionosphere, upper atmosphere and the Earth's magnetic field, etc. The data center of STERN is operated by IGGCAS. The data produced by STERN can also be open to the public. Space Environment Exploration System is composed of an observation chain and a data monitoring and processing center. 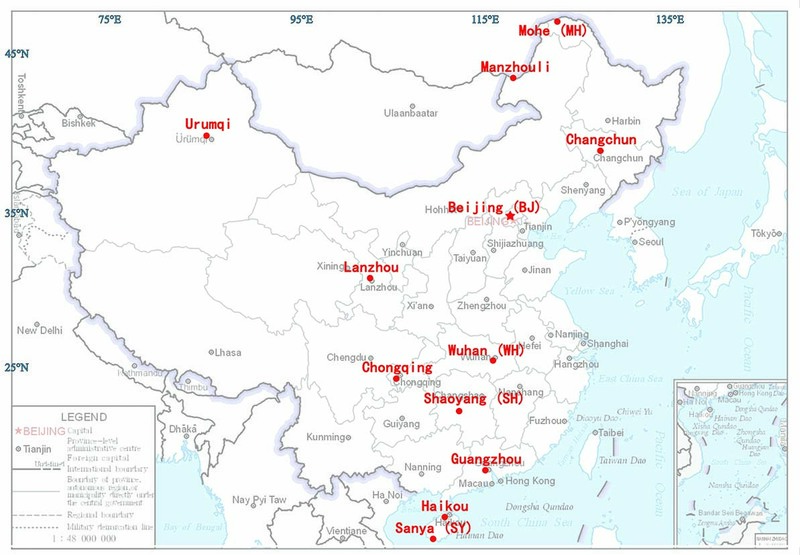 Observation chain have 4 stations which located at Mohe, Beiing, Wuhan and Sanya. Meanwhile, some relative observation is also carried out at Zhongshan Station in the Antarctica and Yellow Station in the Arctic. The system focuses on a continuous observations of earth's space environment for obtaining relevant space environment parameters on the geomagnetic field, electrical field, electron density, wind field, temperature etc. in the upper atmosphere, ionosphere, magnetosphere. At present, there are a variety of advanced ground based instruments, such as proton magnetometer, fluxgate magnetometer, Digisonde, GPS ionospheric TEC and scintillation monitor, HF Doppler, all-sky meteor radar and airglow imager etc. The data monitoring and processing center can monitor the observation instrument working state in all stations and collect and process data through Internet. Some of processing data results can be published on the web near real time( http://space.iggcas.ac.cn ). 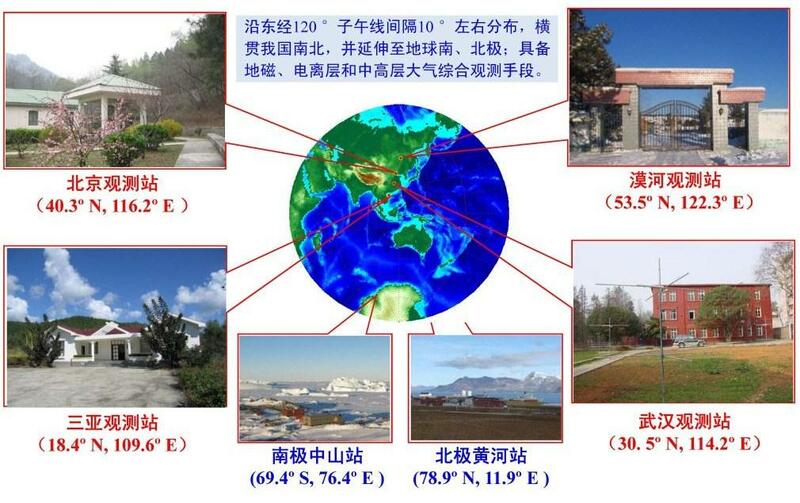 In order to investigate the characteristics of the space environment over China effectively, the 4 stations of the observation chain set up along the longitude from the northernmost to southernmost in the main land of China, which are of the important part of Meridian Space Environment Monitoring Project in China. In the observation chain, Beijing station is a standard permanent geomagnetic observation station and a member of International Real-time Magnetic Observatory Network ( Intermegnet ) . Wuhan station has the longest history for ionospheric observation in China and play an important role in observing and studying ionosphere with its variety of advanced equipment now. Seismic Array Laboratory has 172 sets of import seismographs including very broadband types STS-2 (120S-50Hz) made in Switzerland and CMG-3T (120S-50Hz) made in England, broadband types CMG-3ESP (30S-50Hz, 60S-50Hz) made in England, 130 sets of domestic seismographs including broadband type BKD-2 (20S-40Hz) and short period type CDJ-S2A (2Hz-80Hz), respectively; the lab also has 172 sets of Reftek recording system including types REFTEK 72A and REFTEK 130A made in USA, 90 sets of domestic recording system including types DAS24-3A and DAS24-3B made in the lab, respectively. At the same time, a seismic data processing system with international standard and data sharing policy is established correspondingly in the lab.